Auto Sweet Tooth is the autoflowering version of Sweet Tooth. It is a high yielder and is able to offer 200 grams per plant. It is very easy to grow and resistant to fungus. Auto Sweet Tooth is the autoflowering version of Sweet Tooth, also from the Barney's Farm see bank. It is a Indica-dominant strain growing little not usually excedding half meter. 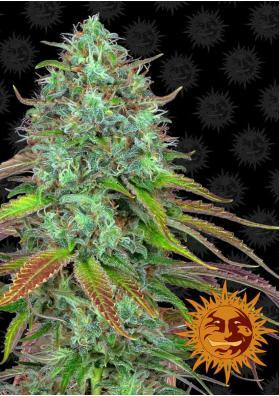 Despite its short stature and normal number of lateral branches, it is able to yield great productions for an autoflowering strainas it can give 200 grams per plant. This plant also has a short flowering time and after only 9 weeks it ends the maturation of the buds. Like the majority of automatic strains it is very easy to grow and requires basic cares. Moreover, it is resistant to fungus and diseases tolerating fairly well temperature changes. Besides that, due to its indica structure it is perfect for small growing areas. Despite growing fairly well in outdoor, we recomend to use the Sea of Green (SoG) technique to maximize its performance. Its smell and taste are close to the original Sweet Tooth strain, earthy, sweet and long-lasting. The effect is body relaxing due to its 16% THC level.